Experience an H.P. Lovecraft inspired VR game that will leave you disturbed long after playing it. Explore the mind of a murdering psychopath and witness his brutal and gruesome memories. Feel the helplessness to aid poor Lily as she is beyond help and only a memory trapped in the psyche of the demented patient. Virtual Reality is a medium that can deliver information and content like no other today. It can encompass the user in an isolated world of it's own with an intensity that is so realistically life like that although the technology is far from perfect, the potential is immense when it comes to delivering these experiences. The user is inside and in the midst of the experience itself so one can imagine the effect it could have. Insanity VR: Last Score is such an experience. A free2play horror game for the HTC Vive, it is also said to be one of the most beautifully created yet disturbing VR games available today. The game was a graduation project of a group of students from the University of Applied Science, Salzburg, Austria. They decided to create a VR game that was a Psycho Horror Thriller that focused on the dark side of the human mind. The premise of the game lies in the near future where medical specialists can delve or enter the mind of patients suffering from mental disorders in order to help and treat them. The player plays the part of an intern assigned to help a patient named Timothy, an old instrument maker. Playing the game, you will have to unlock the dark and deep abyss of Tim's mind and what you will find will be very very nasty. 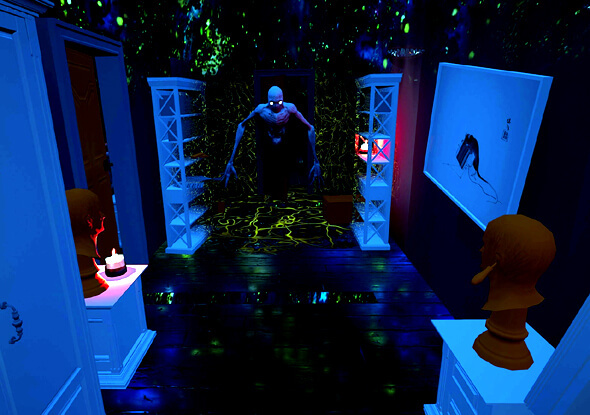 Insanity VR: Last Score aside from being bone chilling horrific is foremost a puzzle game. 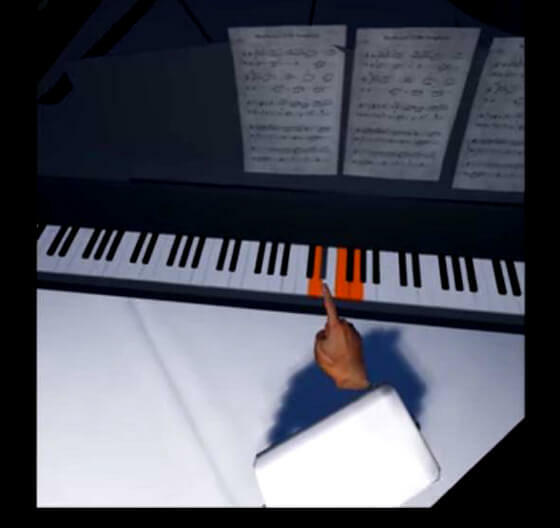 The main objective is to find the missing keys strewn all over this place in his mind and place them back on a piano. However, to do this you will have to read the bits and pieces of notes scattered around, find and play cassette tapes, pick up tools like a hammer, screwdriver and a wrench among others. Open boxes and doors and explore the surroundings. At the start of the game, there will be a brief tutorial that will show you how to move around and pick up objects in the game. Pay special attention to objects that are lit-up bright orange as they are things that you can interact with to solve the puzzles and move forward with the story. One word of warning though, at the start, it will be mentioned that you should do things as quiet as possible. Making a lot of noise will alert the currently inert mind of the patient and will activate its defenses to shut you down. This is in the form of a hideous creature that will go after you and a bunch of eyes all around that will look at you. Should the monster arrive, run away quick and hide till it goes away. Do not attempt to even fight it as it will attack and boot you out of Tim's mind. As you explore the dark and dreary place of a mind, a voice will continually give you suggestions and clues. One of that is a part of Beethoven's 5th Symphony which you will have to strike on the completed piano keys. 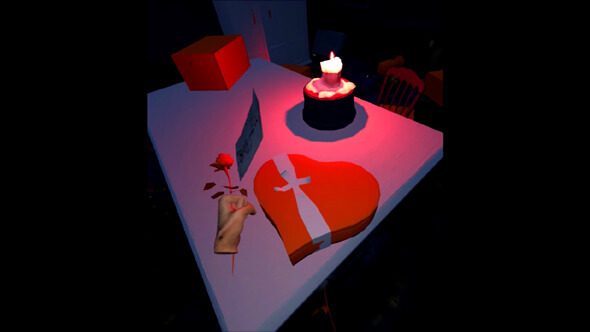 Make sure to find and read a special letter lying around as the game will present you with the gruesome love story of Lily and Tim. A beautiful girl with a beautiful voice tortured and finally murdered by her own psychopathic boyfriend, Tim. Based on the things that you see and learn, you will have to perform several actions to complete the game. To avoid spoiling a potential horrifying storyline, let's just say that after Tim accidentally kills Lily out of his madness, what he does to her dead corpse will be one of the most horrific and nightmare inducing thing that you will see in VR. The fact that you're there staring at poor Lily in full realistic color and gore and the final action you will have to perform to finish the game is a masterpiece in dementia. The expression of her dead open eyes alone will be an image that would be difficult to forget. Controls in VR are good, not perfect but good. You move your arms up and down to move, and seeing your disembodied hands bobbing up and down in the game can be amusing. Grabbing objects is similar with other games though can be difficult at times as you have to be as quiet as possible. The graphics is well done and the ambience of fear and dread is superb. The sound effects are good as well as the musical scores in the game specially the Last Score which comes out from the final action you will have to perform on poor Lily. The music is so sad and frightful at the same time. If you have delicate medical conditions and should avoid disturbing scenes, unfortunately, it's best to avoid this game. Overall, if you luv horror/suspense/thriller and gross, if you've got an HTC Vive set-up, do not let this game pass you by. Being H.P. Lovecraft inspired, this game delivers! Just don't do it before going to bed.